Hi, I'm Landon, the new Athens Farmer’s Market intern. I’m a 4th year Anthropology student at UGA and highly involved in the campus and community with leadership roles in Students for Environmental Action, Bag the Bag, and Anthropology Society. I’m super excited to help serve the market in any way I can. I’ve never been much of a blogger so let these next few weeks be a time for sowing journalistic prose and weeding typos and comma splices. So this past summer I watched literally every episode of Buffy the Vampire Slayer to relive a spunky 90s adolescence I never had. So to honor the unlucky casualties of Sunnydale, my first is about garlic. Slaying aside, garlic has been recently touted as a super food with numerous health benefits. Recent research has been proving the efficacy in treating high blood pressure, high cholesterol, coronary heart disease, and atherosclerosis. It’s also used as a preventative remedy for various cancers, as an oral and topical antiseptic, and for combating stress and fatigue. The active chemical component which makes it such a panacea is allicin. Yet allicin is generally unstable, so it changes quickly after garlic is harvested and broken. According to WebMD, garlic capsules and aged garlic have far less allicin or less potent allicin. Essentially, with fresh garlic you get the most allicin for your buck. As Jay Payne of Cedar Grove Farm says, we should always strive to think critically and be informed consumers. Especially for a “fad” food like garlic, you should question how it is marketed and question bold curative claims. However, with few potential side effects, adding more local, fresh, and consciously grown garlic to your diet can’t hurt. So if you’re anything like me, Garlic has been a staple in my life since my Nona’s fresh baked garlic bread. Yet during my most recent trip to the market I had an embarrassing epiphany: I had no idea what garlic looked like above the bulb. It has always just come to be prepared in a cute bulb, ground into a powder, or diced in a jar. 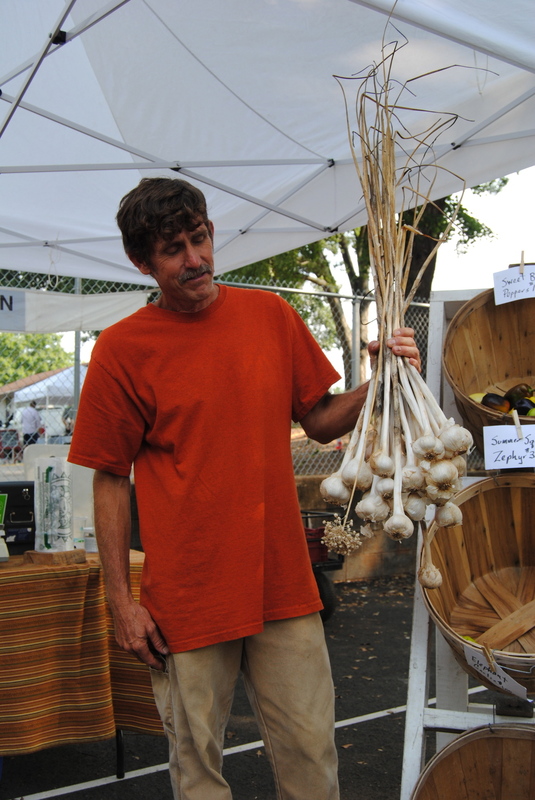 At the market this past Saturday, I met John Carter of Harvest Moon Garden. He had two bushels of Elephant Garlic, one with large bulb garlic to which I’m accustomed, and one with meter long stalks. In a stroke of insight I began to piece together the origins of my food. “Duh, Landon, they have stalks with leaves just like onions.” Also one particular stalk had this dried out flowering head that reminded me of when my sister would hang-dry her ex-boyfriend’s bouquets. Carter said that he’s noticed that if he doesn’t prune the stalk, the bulb becomes notably smaller due to nutrients being diverting to flower growth and reproduction. I’m no botanist but it makes sense to me. One interesting thing about his Elephant Garlic was that instead of being made of small cloves adding up to one big bulb, the inside is simply one large, solid clove. Technically, Carter tells me, it’s not even in the garlic family but closer related to a leek. But before you reject everything I’ve said about garlic until this point, it still has plenty of allicin (the good stuff) so we’re just gonna go with it. Cooking with it was pretty similar to conventional garlic. Pealing was way easier and I simply minced a decent portion of the bulb unlike using one clove. Immediately I noticed the Elephant Garlic smelled much milder and didn’t make my fingers as sticky as conventional garlic. It is mild enough to chop into a salad or use as a garnish. If you’re a garlic-o-phile like me, plan to add more to get the same garlic intensity. So for my post market dinner, I made a super easy farm fresh dish. I used the Elephant Garlic from Harvest Moon Garden and beautiful green and purple okra from Cedar Grove Farm. It was so simple I can’t think of a punny title for it and can describe the procedures in one run-on sentence. Wash your veggies, heat your oil, sauté your garlic, add your okra, pinch your salt, and wait until okra has golden edges. It is easy enough and ended as a crisp, hearty, and delicious pairing that I’ll definitely be trying again in the future. I encourage you to re-examine what you think you know about your food. Maybe I’m the only one who didn’t know what garlic looks like but I implore you to have an inquisitive mind, engage with a farmer and shake the hands which harvest your food, discover delicious deviations of your “go-to” foods and above all, eat and be well.